My Printed Clothing: Custom T-Shirts, Polo Shirts, Hats & More! Welcome to My Printed Clothing. We have a huge variety of personalised clothing to choose from; whether you are looking for high-quality, custom T-shirts, professional-looking polo shirts, or something else entirely, we are confident that we can meet your requirements. All of the items we supply can be printed or embroidered with your custom branding. Our simple 4-step process makes it easy to create you own printed clothing online: simply select a product, choose a colour, upload your logo, and make your payment using our secure checkout system. So what are you waiting for? In just a few clicks, you can have your very own personalised polo shirts, T-shirts, beanies, football kits, jumpers, baseball caps, and all kinds of other garments! Have you ever seen somebody wearing their own personalised clothing and wondered where they bought it? Well, here we are! 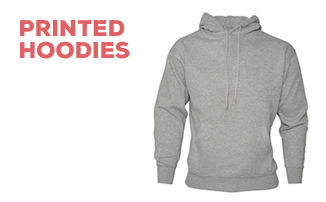 At My Printed Clothing, we make personalised clothing both affordable and easy to order. We have no hidden costs whatsoever - all prices include delivery, and adding your own logo or design to your garments incurs no additional fee. Whether you want branded polo shirts for your workforce, a good-looking kit for your football team, or a few custom T-shirts to sell at your band's next gig, My Printed Clothing are the people to call. To get started, simply select a category, find the product that you wish to customise, and upload your design. You will also be able to select sizes, colours, and other options - we will do everything we can to ensure that your printed clothing is exactly as you have in mind. NEW FOR WINTER: Just in time for the start of skiing season, we have added a great range of branded ski wear to our website! Before you hit the slopes this winter, be sure to order your custom ski jacket and a personalised ski hat to make sure you look your best when you're skiing or snowboarding. As with all of our other customisable products, our ski jackets and hats are produced to the very highest standard by the industry's leading manufacturers - all you have to do is select a product, choose your preferred colour, and upload your logo/artwork through the My Printed Clothing website.